Starting pitchers are a notoriously fickle bunch when it comes to fantasy baseball rankings, but our rankings were pretty solid. We had Jake Arrieta ranked at #7 because we had more faith in him than most people had. We didn't have Cy Young Award Winning faith in him, but we were confident he would have a terrific year. Collin McHugh made our top 10, too, when a lot of guys didn't even know who he was. We also had Masahiro Tanaka at #14 when a lot of people were ready to write him off (and while some others had him in the top 10 due to having too much faith in him). We also had Jacob DeGrom at #22 when he ended up being a free agent pickup in a lot of fantasy leagues. Did we get everything right? No. Did we get more right than most so-called experts out there? Yes. That's because we know how to read pitcher stats, just like we've done the past few years. Look at our explanations below from our 2015 fantasy starting pitcher archives, then use that wisdom to help you draft your staff of fantasy baseball starting pitcher aces in 2016. Some of these guys aren't as much of a "duh" as you might have thought. In true Fantasy Baseball Brass fashion, let's get the "mastering of the obvious" out of the way, first: Clayton Kershaw surprised precisely no one while dominating as the best fantasy pitcher in 2014. Likewise, Felix Hernandez wasn't a remarkable shock as the #2 fantasy pitcher, either. Johnny Cueto, on the other hand, decided to stay healthy and he was lights out all season long. Then there's AL Cy Young Award winner Corey Kluber. 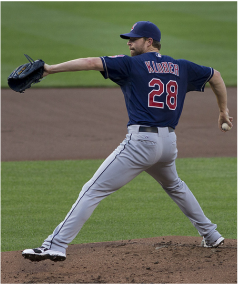 Corey Kluber was a great surprise for the Indians as well as for unexpecting fantasy owners. Did we know Kluber had good stuff? Sure. Cy Young Award-winning stuff? No one worth his weight in rosin would have predicted that. Kulber's 3.85 ERA and 1.26 WHIP in 2013 weren't bad, but they were hardly a sign that he was a Cy Young Award winner waiting to happen in Cleveland. If he was 22 years old when he put up those stats, we would have told you to look out for him last season. On the contrary, Kluber was 28 last season - not a typical break-out age. Now that he's done it, though, now we'll tell you to drat him with confidence in 2015. Don't expect another Cy Young, but do expect an ERA around 3.50 and a WHIP around 1.20. Despite pitching in the majors very sparingly (and pretty poorly, to be honest) in 2012-2013, Collin McHugh ("McWHO?!") showed up in Houston as a mature, 26-year-old rookie in 2014. McHugh flew under the radar for a while until fantasy nerds caught on and picked him up. By season's end, McHugh finished 9th in our overall Brass Rankings, posting an impressive 2.73 WHIP, and an even more-impressive 1.02 WHIP. He also struck out more than 1 batter per 9 innings, and he started 25 games for the Astros, so it's not like it's an insignificant cross-section of statistics. Having said that, it's only one, solid year in the big leagues, but his WHIP and K/9 indicate he knows what he's doing out there. Also, he's still with the Astros, so some of the fantasy nerds in your league will pass him up until the later rounds. Their loss is your gain. Okay... another 800-pound gorilla we have to address: Madison Bumgarner. Did we know he was a stud? Of course. We told you two years ago that he would be the best pitcher on the San Francisco Giants' roster, and we repeated ourselves prior to last season, too. Last season's post-season run was beyond legendary, and we fully expect to see MadBum carry that over into 2015. In fact, given he stays healthy, we see no reason why Madison Bumgarner can't 1) win the NL Cy Young Award, and 2) replace Clayton Kershaw as the top fantasy pitcher in baseball. 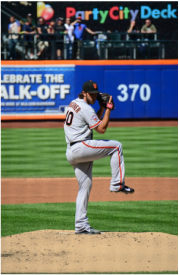 Madison Bumgarner was a terror for batters in the post-season, and he may replace Kershaw as the top fantasy pitcher in 2015. Mike Fiers saved a lot of fantasy teams in 2014, especially during your fantasy league's playoff run. Before last season, Fiers was a relative nobody. In 2012, he was a slightly-better-than-mediocre pitcher, and in 2013, he was an injured mess. Last season, he was straight up dominant as a starter. During the fantasy playoff run last year, he was money. From August 9 thru September 17, Mike Fiers went 6-2 with a 1.68 ERA, 61 strikeouts in 53.2 IP, and an absurd 0.78 WHIP. While those stats have to be a bit of a fluke, no one is that lucky. Fiers is, suddenly, the real deal, even though he'll probably be a late-round pick in your draft given that he only started 10 games. We told you last year that James Paxton was going to be a steal in your draft - possibly the cheapest sleeper pick of all time at starting pitcher. When he pitched, he rarely disappointed, but he spent much of the year hurt. The good news is that that means a lot of fantasy nerds in your league still don't know about him. The other good news is that those who do know about him may be afraid of the injury bug. In 13 starts, he had a 3.04 ERA, 1.20 WHIP and 7.18 K/9. He's only 26 this season, so draft him and hope he stays healthy. 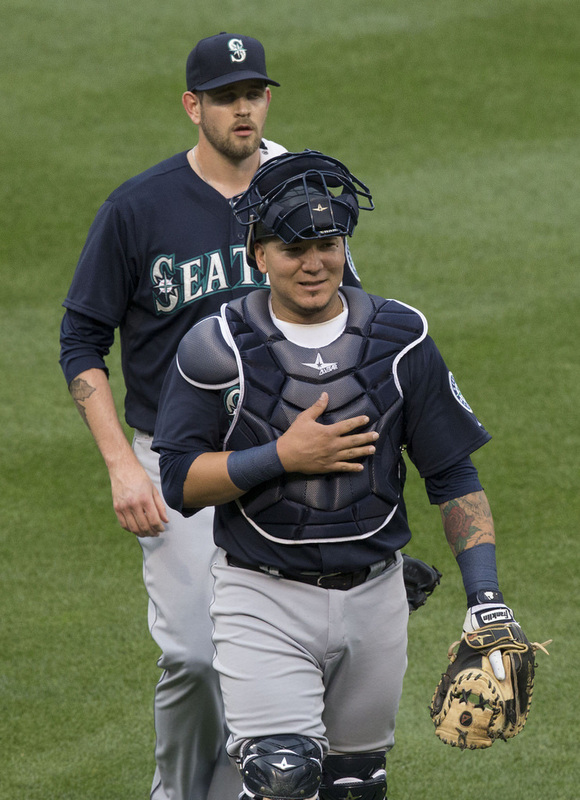 Even his catcher is hiding him from you, hoping you won't take James Paxton as your top sleeper pick at starting pitcher. The Cubs, as usual, had few bright spots. One of them, however, was Kyle Hendricks. Hendricks came out of nowhere in July as a 24-year-old rookie and posted a 2.46 ERA, 1.08 WHIP and a 7-2 record with the Cubs. Hendricks isn't a strikeout pitcher, so there's always the danger of "when he gets rocked, he really gets rocked," but we haven't seen it yet. While the lack of strikeouts may be a trouble spot, his WHIP shows that he knows how to get guys out, one way or another. Jesse Hahn joined the Padres in June of 2014 and promptly won 7 of his first 10 starts in the big leagues. In December, the wheeling-and-dealing Padres sent Hahn to the Oakland A's. Oakland, like San Diego, is a great pitcher's park. Plus, there's something in the air in Oakland that just creates great pitchers out of nothing. Hahn's 1.21 WHIP is better than average, and his 3.06 ERA is, perhaps, good beyond what is WHIP actually indicates. He also struck out 70 batters in in 73.1 innings (8.6 K/9), so that's a plus, too. His minor league numbers also indicate that he's on the path to a lower WHIP once he gets used to the big-league level, which we think will happen around mid-season in 2015, if not earlier. Carlos Carraso was a scrub at the start of the 2014 campaign. IN fact, he was a scrub in 2009, 2010, 2011 and 2013... and the only reason he wasn't a scrub in 2012 is because he didn't pitch in 2012. As a matter of fact, Carrasco started out 2014 as a scrub, too. He began the year in the rotation, but then gave it up like a drunk sorority sister in his first 4 starts with a 6.95 ERA. DAMN! Naturally, he got sent to the bullpen for a while. Apparently, that was the best thing to ever happen to him because he suddenly learned how to pitch. When the Indians needed him in the playoff stretch, Carrasco came through like a boss. From August 10 through September 27, Carrasco started 10 games and posted an absurd 1.30 ERA, a 0.81 WHIP, a shutout and 10.17 K/9. DAMN! Anyway... given his track record, don't expect those stats to continue, but he's definitely worth a roster spot in the last few rounds on draft day. Drew Pomeranz is actually an interesting study of a pitcher who leaves the most hitter-friendly ballpark (Colorado) and ends up in, possibly, the best pitcher's park (Oakland). In Colorado, Pomeranz's stats were terrible. In Oakland, however, Pomeranz put up excellent numbers. He's also a bit older, now, although we hasten to say he's "more mature" given his stint on the DL in 2014 after breaking his hand while punching a chair. Nevertheless, in Pomeranz's last 11 appearances (10 of which were starts), he put up an impressive 2.44 ERA, 8.6 K/9 and a stingy 1.08 WHIP. He's also only 26 years old this season, and there's no sign of Oakland dealing him in a trade. Take a flyer on Pomeranz late in your draft. Just like Scott Kazmir last season, Pomeranz is worth a shot, especially while pitching in Oakland. Then there's Josh Collmenter. He has a funky, hopping delivery, but he has extremely solid and consistent stats, for the most part. in 2014, Collmenter started 28 games, he threw a shutout, posted a 3.46 ERA, 1.13 WHIP - all numbers that are pretty consistent to his career averages. The only stat that dipped while taking on more of a starting pitcher role was his K/9. In 2014, Collmenter's K/9 dropped to 5.8 (from 8.3 in 2013 when he was strictly a reliever). However, in his first season in the big leagues in 2011, he was used predominantly as a starter. His K/9 that season? You guessed it: 5.8, just like last season. It seems as though Collmenter takes his foot off the gas a little when he knows he has to get through 5 or more innings, hence the lower K/9 as a starter. His consistency, however, is impossible to ignore, therefore, we give you the green-light to draft him late or spend $1 on him in an auction draft. He's solid and reliable, especially as a last-rounder.